Ted Burke LIKE IT OR NOT: JOE BONAMASSA v GARY MOORE! JOE BONAMASSA v GARY MOORE! Blues guitarist Joe Bonamassa seems to be the white blues guitar saviour of choice for this part of the 21st century, a situation that has me tipping my hat to his technical acumen, his taste in guitar heroes, and the obvious work he put into his woodshedding to have those fancy chops at his disposal on demand. It's just too bad that all I get when listening intently to his long and frequent solos is the work involved in the effort to get all this text-book perfect. This is superhuman execution without commensurate passion. No fire under all that smoke. At a younger and less discriminating age, I might have been a fan, excited by his melodramatic playing and the authenticity of his rasping growl of a voice. No so much these days, not after a lifetime debating the merits and demerits of Clapton, Winter, SRV and the legions of other guitar heroes that populated the sports arenas off American cities in the 70s, Bonamassa seems no more than the advanced student who's perfected every cliche he could from the generation previously holding court without working on his own style, that rare item called an individual voice. What's the point, I suppose, is the enlightened way to take all this in, or ignore it outright. 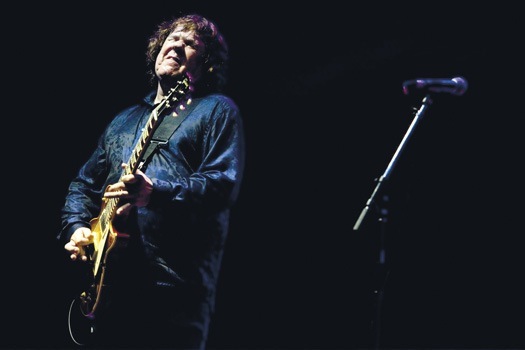 The last white blues guitar slinger to give me the figurative kick in the head was the late Gary Moore. Moore was the last of the great ones, I think, less so for the originality of his chops--save for the speed tested relish and elan of his riffing, little in the way of his velocity seemed new. Moore came by his flashiness naturally, as he loved the work of his defacto mentors--B.B., Albert and Freddy King, Buddy Guy, Peter Green, Erick Clapton--that he didn't want to insult what he perceived their greatness to be by merely mastering their licks faithfully, performing them on command with machine-tooled precision. His work sounds like the energy of someone who picked up on the tweaks, twists, and inventions of all his heroes and sought to find his way to play the blues Over the Top. There is a beautiful aggressiveness to his solos, a sublime benevolence to his fastest and flashiest note clusters. His lengthy expositions are not to everyone's taste, and ours is not a time when music fans of a younger generation speak obsessively of guitar heroes as a concern as essential as food, clothing, and shelter, but to the degree to which this musician committed himself to a style and particular approach to that style, Gary Moore's guitaring--to my tastes --was an inexhaustible font of inspired, riffing epiphanies. Moore mattered, or at least impressed the Dickens out of me, because of the obvious glee with which he took command of the blues-rock form. He might not have invented it, but he certainly ownership of it. He knew what to do with the prize he commandeered. Joe Bonamassa just bores me with all his pro forma shuffles, boogies, rockers, and rave-ups. Slick, well constructed, and stiff as Disney robots. Technique without spirit, that distinguishing attribute that gives mastery of complex concepts a personality that distinguishes it from other virtuosos-in-waiting, isn't art but merely mechanics.